As a society, we’re losing our sense of ambition. We’re more focused on the instant gratification of Instagram likes and Facebook shares than we are reaching for something bigger. I fall into that trap all the time. Just the other day, I was out having the best run I’ve had in weeks, enjoying a very quiet and eerily foggy trail, when all of a sudden I find myself at a complete stop trying to take a picture. I was obsessively snapping different angles, in search of the perfect shot. Why did I need that picture? For posting, of course. In that moment, when my run was going beautifully, I was more focused on snapping a photo that would soon disappear down your news feed, than getting the most out of my run. A run that would lead me closer to my goals. By definition, runners should be considered ambitious. For the most part people don’t need to run. After all, we aren’t going to die if we skip a few weeks or miles. The mere act of going out and running at all requires discipline. And ambition. It requires some sort of drive beyond what’s pleasurable in the moment. So some might consider it unfair for me to say that most runners aren’t ambitious. But that’s exactly what I’m saying. Most of us (runners) aren’t ambitious. Or at least aren’t acting on our ambition within the realm of running. After all, when was the last time you really put yourself out there and did something you were terrified of? And by terrified, what I really mean is poop-your-pants-scared. When was the last time you set a running goal you had no idea if you could complete? For me it was last April, when I ran the Massanutten Mountain Trails 100. Before that it was probably my first marathon. Both of which kept me up at night and consumed my thoughts during the day. Both of which I signed up for, knowing fully well I might not finish. They were the type of massive goal that has changed my life. But that’s just two goals over the course of nearly 6 years. Sure I’ve challenged myself through running, and pushed myself to new limits, but other than those two races, I’ve avoided most of the scary stuff. The key is to find not only what excites you, but what scares you. For me, the ambitious goals that excite and scare me most are all about distance. The goal itself doesn’t matter, as long as it’s ambitious. It’s comfortable being an unambitious runner. We get to run with friends, race casually, and avoid the pressure of an intense training plan. We get to outwardly act ambitious without actually having to put ourselves out there. Sound familiar? It does for me too. There’s nothing wrong with being an unambitious runner. There’s nothing wrong with remaining in the comfort zone. But something amazing happens when you leave that comfort zone. You embrace who you really are. Yikes. Turning our backs on the reason for our existence. This year, as we set off on the year of smart training choices, let’s also set off with ambitious goals. Let’s leave the unambitious runner in all of us behind, and do something amazing. Habit change and goal setting are complex beasts far too big for this single blog post, so I’m not even going to try. What I do want to point out here, are three steps I think are important for anyone embracing their ambition. Small goals are nice. Precious, even. But when it comes to doing something life changing, you don’t want precious. Did you know that small, easy to achieve goals, are actually less likely to happen? Small goals don’t excite you like the big ones. If you know you can do it at any time, and you know that because it’s small, there’s no big reward once it’s done, that goal becomes less appealing. And it’s less likely to happen. Big, ambitious goals, however, are where the real excitement lies. Once engrossed in that ambition, it’s impossible to let go until you achieve what you’re going after. That’s the kind of goal I’m talking about today. 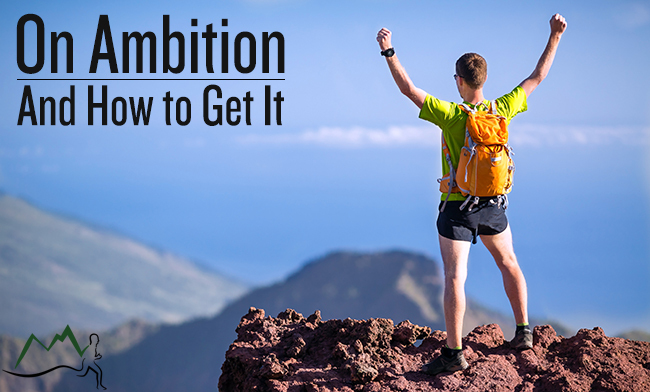 Embrace your ambition by setting a massive goal you can’t leg go of until it’s complete. In 1974, when Gordy Ainsleigh, the first person to run 100 miles in a single day, entered the Western States Trail Ride (the original horseback riding event that eventually became the Western States 100 mile run) without a horse, no one believed he could do it. Fellow horseback riding competitors laughed at him. But he was convinced he could run the race on foot, just as well as the horses. And if he couldn’t, he sure as hell was going to find out the hard way. So even though all conventional wisdom and logic were against him, Gordy set out to do something massively ambitious. Because he was obsessed with the idea of running that race, he knew he had to go after it. When you set a goal to run an ultramarathon, don’t just tell people you’re going to try to run your first ultra. Tell people you’re going to do it. Don’t tell people you’re going to try to lose 10 pounds. Tell people you’re going to lose that weight. When you’re able to leave doubt behind and go all in, there’s no stopping you. Gordy finished in just in 23 hours and 42 minutes. Just 18 minutes before the 24 hour cutoff. He knew he could do it, and there was no stopping him. When you’re convinced you can do something ambitious, you can’t stop until it has been accomplished. The best way to feel the excitement, drive, and belief in something ambitious is to revisit it all the time. That last one is something I learned from Seth Godin’s Pick Four. It’s a simple workbook where every single day you revisit your ambitious goal and write down whether or not you think what you did that day was enough. Checking back in is powerful. And the beautify of a big, ambitious goal, is that the more you put into it, the more obsessed you become. That obsession keeps you checking in on your effort, and becomes you’re most powerful tool. You know the saying, “Get comfortable with being uncomfortable.” I have know idea where it came from, but I like it. It’s guaranteed to be a lot of hard work, and you’re always risking failure. Those two things will make you feel uncomfortable. Right now I’m working hard to be uncomfortable myself. I have big goals for my running and for helping you and so many others through this site. They are the most ambitious goals I’ve ever set, and I couldn’t be more excited. I also couldn’t be more uncomfortable. But I’m slowly getting comfortable with that discomfort. And I hope you will join me. Don’t just continue along the path of being an unambitious runner. Do something big. Do something ambitious. It’s time we quit turning our backs on ourselves, and see who we really are. Thanks for this posting. How true for ambition! 2 days ago I registered for my very first ultra run at 32 miles. This race is the Bighorn Mountain Trail Run in June and several runners who posted on this run stated it was one of the toughest runs they have ever done. I am a road runner, recently new back to distance running, (2 years now). I come from an old school type of running, 58 years old and love running once again. In 2013, I completed 2 marathons and was training for my third, when I became injured by a slip on the ice. All that winter and into summer, I recovered and am now back into organized training. For 2015, I have already registered for 3 races, 2 of which are ambitious for me. The Bighorn race and a winter half marathon in February, (I hate the cold!!!). I am scared of both races, but highly excited at the same time, How exhilarating it is to set ambitious goals that keep you awake the closer you get to facing them. How challenging it is to know you are reaching for something you have never done before. And how satisfying it is to see the reality of it coming true the closer you get to your never before accomplished goals! How unboring it makes the rest of your life, taking you from the mundane to the magnificent. Once again, thanks for your writing and what you contribute to the lifestyle of running. Maybe one day I’ll see you on the trails!! That’s great Dean! It sounds like 2015 is going to be a great year for you. Let me know how those races go! Thanks Brooke! I can’t wait to be a part of your ambitious goal this year! Doug- Found your article through the No Meat Athlete Academy and this really hit home with me, I’ve been an unambitious runner. I am registering for my first 50K today and going all in! Thank you for the inspiration!